Available on Kindle and as Google Ebook. For an introduction to the full database and 21 intersecting explanations, see Trump Election Win: Intersecting Explanations. Hundreds of thousands of Americans mobilized to oppose apartheid in the 1980s. That successful movement built on decades of behind-the-scenes links between African liberation movements and American activists, both black and white. 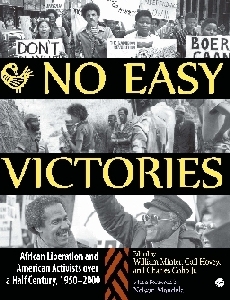 No Easy Victories draws on the voices of activists of several generations to explore this largely untold history. Today Africa and the world face global injustices as deadly as apartheid. Understanding this history of solidarity is essential for finding new paths to a future of equal human rights for all. William Minter, Gail Hovey, and Charles Cobb Jr, eds. 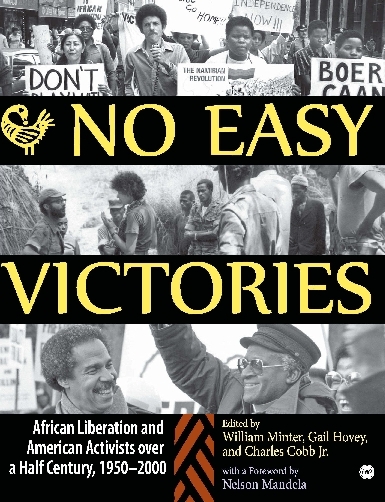 No Easy Victories: African Liberation and American Activists over a Half Century, 1950-2000. Trenton, New Jersey: Africa World Press, 2007. 8.5" x 11" large format. 120 photographs. References. Index. xvii+247 pages. $29.95 list price. ISBN: 1592215750. William Minter taught at the secondary school of the Mozambique Liberation Front in 1966-68 and 1974-76. An independent scholar and activist, he is the author of Apartheid’s Contras and other books. Gail Hovey was among the founders of Southern Africa magazine in 1964 and worked in South Africa in 1966-67. She served as research director for the American Committee on Africa/The Africa Fund, as managing editor of Christianity and Crisis, and as executive director of Grassroots International. Charles Cobb Jr., senior correspondent for allAfrica.com, was a field secretary for the Student Nonviolent Coordinating Committee (SNCC) in Mississippi in 1962-67. His books include Radical Equations (with Robert Moses) and On the Road to Freedom: A Guided Tour to the Civil Rights Trail.